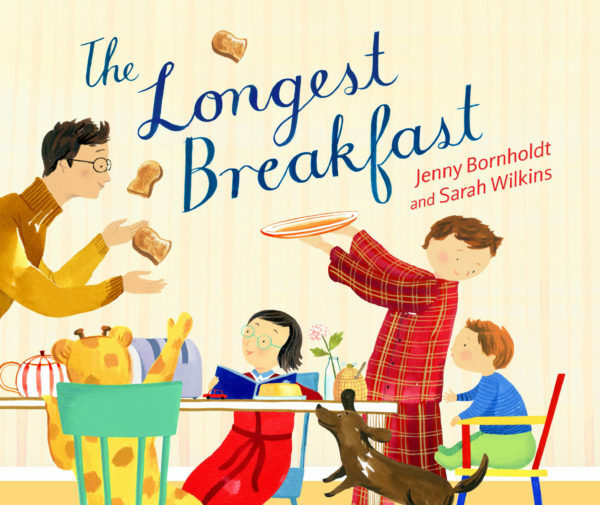 I am so thrilled I had the opportunity to interview both Jenny Bornholdt and Sarah Wilkins for their new children’s picture book The longest breakfast (previously reviewed here). I want to thank them both so much for taking the time to talk and sharing their ideas. Writing a story and having it illustrated demands so much in terms of collaboration and sometimes it doesn’t quiet work out but I am very pleased to say that in this case, the collaboration is perfect. I will start with Jenny. As a poet, language and words are so important especially with the less is more kind of theory. The longest breakfast follows this well. Did you start off with a busy but brief plot in your mind or did it work out this way because of your love for poetry? When I began thinking about the book I didn’t really have a plot, more a collection of things that I felt went together somehow. There was the fact of our youngest son’s early speech, which was very difficult to understand – we did, but no one else could figure it out – a friend who liked pudding for breakfast, and a dog and child having the same name. When I began writing the story, it turned into a kind of slapstick with characters making unexpected entrances, people mis-hearing each other, and the father, Malcolm, trying to keep calm and hold things together. In this kind of story you don’t need a lot of words – their role is to cue the action, which is mostly told through the illustrations. The way the book is written is really driven by the kind of story it is. This hasn’t really answered your question about poetry, sorry. Where the two kinds of writing meet, for me, is in an attention to language and rhythm. As a writer, how hard is it to hand over your story to an illustrator and their personal interpretation of your story? Sarah and I have worked closely together on the two books we’ve done together, so I’ve never had the sense of handing my story over to anyone. It’s very much a collaborative process. I feel that my writing is only half of the story and know that Sarah will make the other half. In The Longest Breakfast we talked a lot about what Malcolm might look like and what kind of kitchen the story would happen in. We also discussed how the story ‘felt’ and what that might look like in terms of illustrations. There is a certain amount of chaos with the family in this story. How does a morning play out for you? Now that our children have grown up my mornings are nothing like in the book! Did you enjoy writing as a child and what advice would you give to young writers? Yes, I’ve always loved writing. When I was younger I wrote stories. I didn’t start writing poems until I’d left school. The best advice I can give to people who want to write is to read. You can learn a huge amount from soaking up how other writers do things. Lastly if you could meet any character from any book, who would it be and why? Little My from the Moomintroll books, because she’s so feisty. And now let’s hear from Sarah. As an illustrator, do you feel any pressure when trying to interpret the writer’s ideas and bring the story to life or do you completely take your own ideas and work around them? I’ve never felt any pressure collaborating with writers. It’s more that I feel a responsibility to interpret a writer’s ideas and enrich the world in which they exist, whether it’s for an article in a magazine or a picture book. Almost all the picture books I’ve done have been with authors I know so there has been a lot of trust and dialogue along the way, and I suppose a certain amount of flexibility on both sides. I feed my own ideas into the work but the author’s words act as the inspiration and framework for my visual storytelling. I love how the more impatient the baby is to be heard, the more space the baby has until finally the baby takes up the whole page. Is this something you plan all along in your drawings or does it just sort or happen as you go along? It’s a bit of both. I try to create a visual rhythm that is in time with the rhythm of the text. I begin with initial simple pencil sketches and paste them along with the text into a mock-up book. This gives me an overall view of the flow and shows me how the individual images are working with the paginated story. I think the baby’s frustration at not being understood is the natural climax of the story so it needed to be treated differently to the surrounding images. What is your favourite medium to use in your illustrations? It changes all the time. I’ve gone through phases of only using gouache, then I switch exclusively to acrylic, and currently I’ve added ink to my repertoire. For the Longest Breakfast I mainly used ink and watercolour and then added more solid areas of colour with gouache which is great for line work and adding fine opaque details. I love the spontaneity ink brings to an illustration. I scan all the completed illustrations into PhotoShop in order to clean up any mistakes and adjust colour and sometimes move anything that’s not quite in the right place. Did you enjoy drawing and art as a child and what advice would you give to young artists? Yes, I did enjoy drawing, but no more than the next child. I actually enjoyed reading and writing more. I even remember feeling a little unsure of my drawing skills, especially compared to my big sister who was the queen of colouring books. So neat and always within the lines! My advice to young artists is to persevere. Just keep doing it and you will get better. For most of us it takes years to find a genuine voice in this industry, and having the patience to keep going is essential. I’d like to meet Pippi Longstocking because she’s so unconventional and strong. This is another wee gem that Jenny and Sarah have worked on together. This is a gentle, sweet and heart-warming book and I fell in love with Red and all the creatures and birds that inhabit Red’s branches and hollows. Red is old, more than two hundred rings old and very wise. Red has seen so many things happen over the years but none have tempted Red to break the forbidden rule more than what is happening now. I loved the language and the subtle messages. The book may be just over 200 pages long but the chapters are very brief, sometimes only a page long and there are some lovely illustrations but it really is a quick read with a powerful message. There is an old Irish custom where people can leave wishes on a tree and for Red that has been happening in May for many, many years. Most wishes are superficial but others are heart-achingly honest like Samar’s, the young Muslim girl in this story. We are witness to racism, ignorance, wanting to belong, loneliness but most importantly, hope. I wanted to hug Samar and tell her everything was going to be okay. I wanted to sit beneath Red’s big branches and watch the animals and birds coming and going. I wanted Red to be in my backyard. This is one of those rare books that needs to be in every school and read to every child. 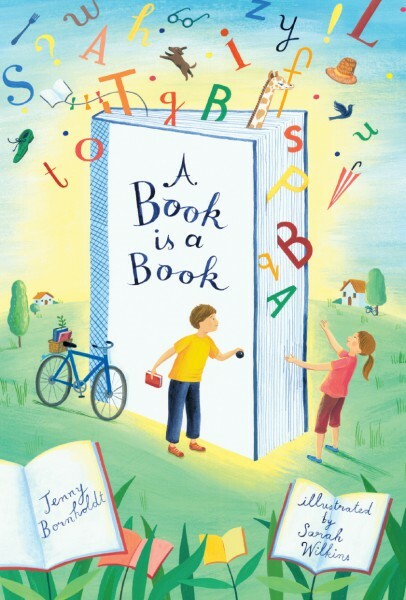 Learning to accept each other and our differences is at the core of this book. A book that deserves reading over and over. I bought this book for my school library but will be buying my own copy as well. I may also have to buy multiple copies for our book club as there is so much to think about and so much to love. It is a wee gem that warms the heart. The trailer to this book is just beautiful. The cover alone of this magical book just beg you to pick it up and turn it over and hold it close. Purple, blues, blacks and white and the rustic and fiery title stand out and immediately you just know this is going to be a good book. And it is good book. A very good book. 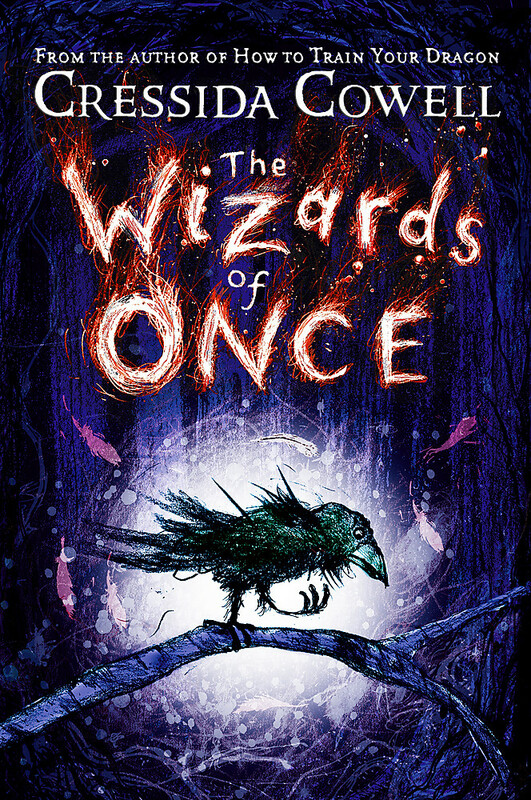 Cressida Cowell long known for her wonderful How to train your dragon series has come up with another wonderful series. Her illustrations are both comical and dark. Some make you smile, others have a haunting quality to them making you just a little afraid (or a lot!). The story grabs your right from the prologue. Once there was Magic. It was a long, long time ago, in a British Isles so old it did not know it was the British Isles yet, and the Magic lived in the dark forests. So the setting is already becoming pictures in our head. We know we are going into a dark and scary place where anything is possible. When Xar and Wish meet they immediately hate each other and very much distrust each other but suddenly they are forced to work together for there is evil happening. Witches have returned and witches are bad, dangerous and to be feared. This book has it all. Magic, fantasy, pace, danger, adventure and humour to remind the reader they are actually safe even though the world they are reading about seems so real and scary. Xar is arrogant, a little selfish but also a little sad and flawed which is why we can’t help but like him. His father shows only disappointment towards him as his magic has not started as is expected of a boy his age. Wish is a warrior but lacks any warrior-like standard her mother Queen Sychorax demands so is also a disappointment. It is a shared sadness at not being quite good enough that Xar and Wish have in common. Both have something to prove and it is this connection that draws them together despite their hate for each other and the different worlds they come from. There are many other characters involved as both Xar and Wish each have their own companions. I do particularly love Squeezjoos a little hairy fairy belonging to Xar. He is funny and brave and in danger mostly, which is part of the whole adventure, trying to save Squeezjoos life. This is a really good read which has been beautifully produced. Large text size, lots of illustrations to break up the text and lots of little bits in between like the Spelling book pages. The map of the Warrior Empire and Wizard Wildwoods is also a wonderful treat. I do love a book with maps as they add so much and help me build pictures in my mind as I travel with the characters. Great fantasy novel for readers aged nine up. Can’t wait for the next book – really can’t wait! If you want a sneak peek you can read a sample chapter here. The trouble with a good adventure story is that reading a sample chapter isn’t enough. It just makes you want to read the whole book and this sampler does exactly that. I now want to find out what happens to the characters throughout the rest of the book. Teaching notes for extended exploration of this novel can be found here. You can also check out the trailer for The Amazing Spencer Gray which is the first book about Spencer. A series worth checking out for adventure, danger and a bit of fun along the way. It is hard to know where to start with Gavin Bishop’s latest book. There is just so much on offer, so much to be explored. So I will begin with the cover. It is a larger than normal portrait size hardback that stands out, grabs your eye immediately and begs to be picked up. I can’t resist spreading this book out to share the whole stunning cover. It is a masterpiece on its own. Gavin’s work is very distinctive, you would recognise his style anywhere and while this is still true here, what I love is the introduction of so many wonderful blues. Aotearoa is a stunning pictorial reference book from cover to cover. The end pages, and the title too are stories in their own right. I love how the title of the book Aotearoa is in its own white cloud suggesting that absolutely everything has been well thought out in the writing and production of this book. Starting with the big bang and looking forward with hope for the future, this book and its stories can go on and on. It is a great reference for adults as much as children and essential to every school in New Zealand. Information is bite-sized, and enough to whet the appetite of students of all ages to perhaps do further research. It is a book to dip into over and over and it isn’t even necessary to read it in order. The book has all the key points in a quality non-fiction book including a contents page and a page dedicated to Maori/English translations which is always helpful. I must say that on page 34 under Education, I felt a great sense of pride and a big smile crossed my face as I read about the Fendalton School being the first open-air classroom in New Zealand way back in 1924. I have a very personal interest in this school and its history, so this certainly made my day. While I bought this book for our school library, it may just be that I have to go and buy my own copy as I am not sure I want to hand it over. It is wonderful, stunning, informative, and essential. A beautiful coffee table book in any home. 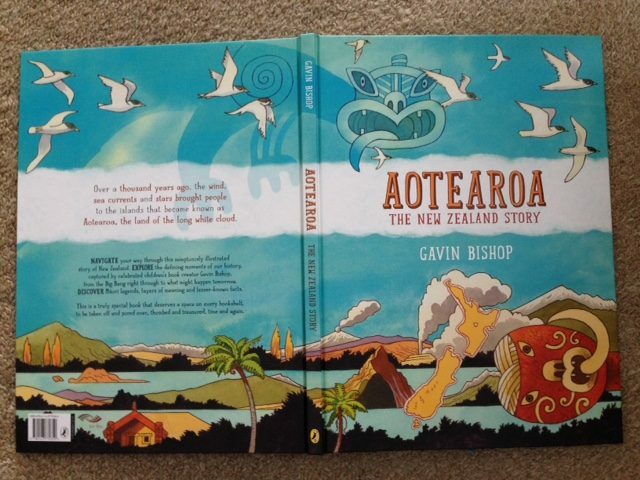 Gavin Bishop at his best and I have no qualms predicting this, that Aotearoa will be an award winning book in next year’s book awards. It really is a treasure. I am lucky to be going to the book launch this week so hopefully I will be able to get this copy signed.